kePresence package offers basic functionality necessary to deploy dynamic website. 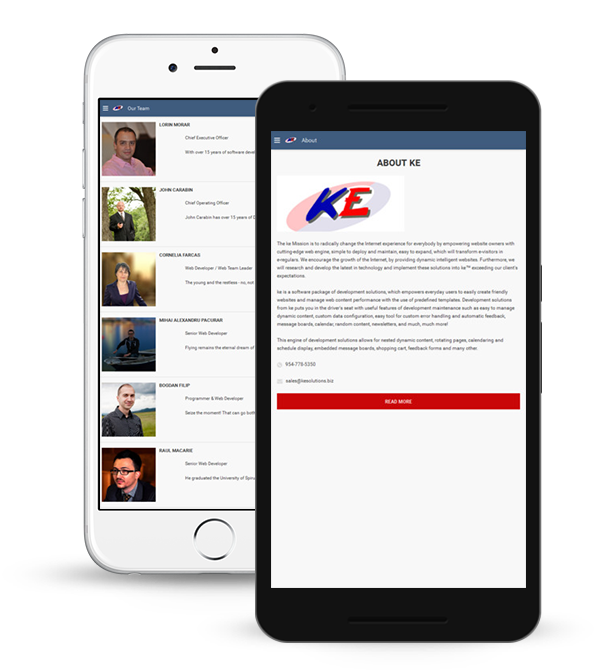 With the kePresence package, you are prepaying for necessary items such as bandwidth usage SQL server, ke™ and storage, as well as additional components to provide more compelling presentation of your website on the internet. Some of the add-on functionality includes feedback forms, newsletters and random content. With newsletters you can publish your own e-zine to your subscribers and even promote your offline business. Newsletters are an easy way to stay in touch with your visitors and to inform them of new areas and upcoming events on your website. You can solicit feedback from your visitors to improve experience of the website. You can even design custom short surveys. With random content you can keep website more attractive and constantly updating. Random content could be a featured article or even rotating banner exposure. The latter can provide revenue stream opportunity from 3rd party websites. With kePresence package you will be able to make modifications to your website. You will no longer need to pay yet another fee to your existing web design company just to correct a spelling mistake. You will be empowered to publish your own webpages. All functionality in your package is ready to be deployed on your website, you do not have to wait for your guru guy to find time to actually implement your newsletters or your feedback forms. It's all in here and ready to use. With random package you can offer banner advertising on your website. You can acquire additional revenue stream from companies that consolidate content advertising such as commission junction or even google. With newsletters you could publish advertisements for other websites or even your own offline store. You will also be able to create your own surveys and even run surveys for companies that want to outsource market research. This package features your own domain name and emails. You will have access to keAdmin tool, which will enable you to make modifications to the website on your own without the need to pay graphic or website designers every time. There is no limit preset on number of pages, so you will be able to present much larger selection of information on your website. Having large number of pages will improve your web search ranking and you will generate more visitors from keyword searches. You can then monetize this added traffic into additional revenue. Entire website is dynamically created from database from pieces of information, so it becomes much easier to maintain and even rebrand or redesign your website, than with traditional web designs. Major feature of the system is clear upgrade path. If one day you decide that you must have, for example, message board functionality, this functionality can be added to your website almost instantly (once you agree on design layout). On the ROI, there are many ways of generating revenues and a good place to start would be to look at some ideas in module specific description on this website. In the course of successful web development, you will face need to implement new functionality. With kePresence you rest assured that functionality is maintained and that you do not need to spend large sums of money to upgrade to one of the additional modules already available via the upgrade path. The overall TCO is kept low at manageable monthly fees and out-of-pocket expenses for development of new modules are minimized or entirely eliminated. With kePresence you can rest assured that ongoing development improves your website's performance and addresses any concerns or issues that may arise without the need for you to pay new development fees.